On Tuesday, Venezuela's Ambassador to Russia Carlos Rafael Faria Tortosa said that US humanitarian aid could be a trap to be followed by military invasion. Venezuelan opposition leader Juan Guaido announced Tuesday that humanitarian aid will enter Venezuela on 23 February, he said during a rally in Caracas. He also urged the armed forces that are loyal to President Nicolas Maduro let the aid enter the state. READ MORE: Venezuela Humanitarian Aid: 'Noble Gesture' or Demonstration of Strength? 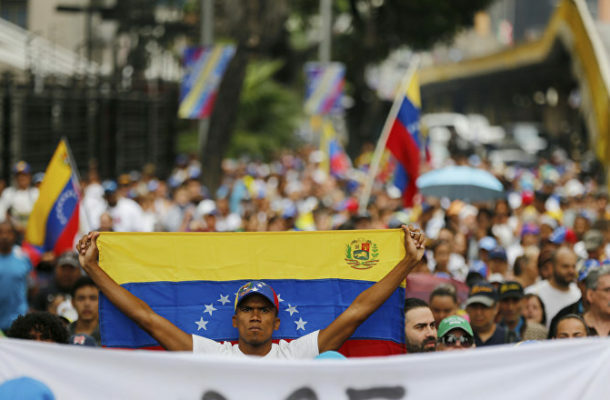 Guaido's remarks come as earlier on Tuesday a Sputnik correspondent reported that numerous Venezuelan opposition supporters took to the streets of Caracas to demand that the government let in foreign relief aid. On the same day, Venezuela's Ambassador to Russia Carlos Rafael Faria Tortosa said US humanitarian aid could be a trap to be followed by military invasion. Meanwhile, Venezuelan authorities state that the country does not experience a humanitarian crisis, with President Nicolas Maduro, who holds Washington responsible for staging a state coup in Venezuela, having slammed US assistance as a "political show".